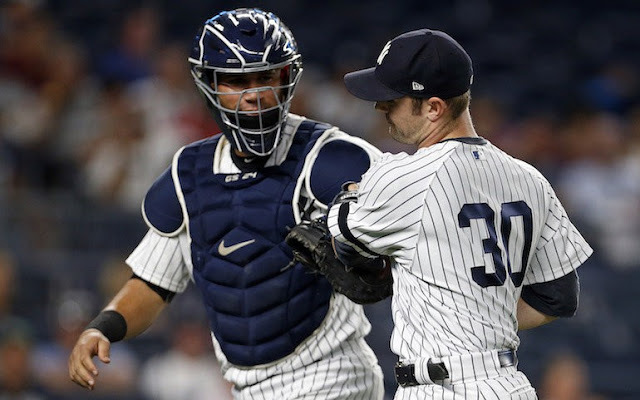 Tuesday night, Aaron Hicks found himself back in the starting lineup after his latest stint on the disabled list. Not a moment too soon as A-A-Ron sparked the Yankees to victory with his superior catch in the first inning. The game didn't start so well for young Mr Jordan Montgomery. Kevin Kiermaier got the game started with a single up the middle to center field. Stephen Souza, Jr singled through the hole at short into shallow left field. Montgomery had Evan Longoria on a full count but lost him with Ball Four. The bases were loaded full of Rays with no outs. Monty finally struck out Logan Morrison to secure the first out. 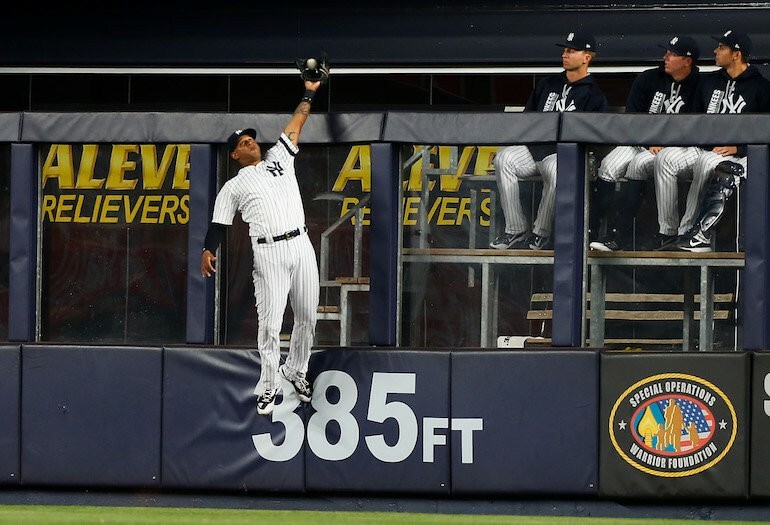 Wilson Ramos was up next and he blasted a shot over the center field wall for a grand slam...no, wait...Aaron Hicks with the spectacular over the fence catch for the second out! Kiermaier tagged and scored on the play. I am not a math major but I'll take a 1-0 deficit over 4-0 any day. Montgomery struck out Adeiny Hechavarria, who has seemed to feast on Yankees pitching this year, to end the inning. Whew! Monty and the Yankees dodged a major bullet. 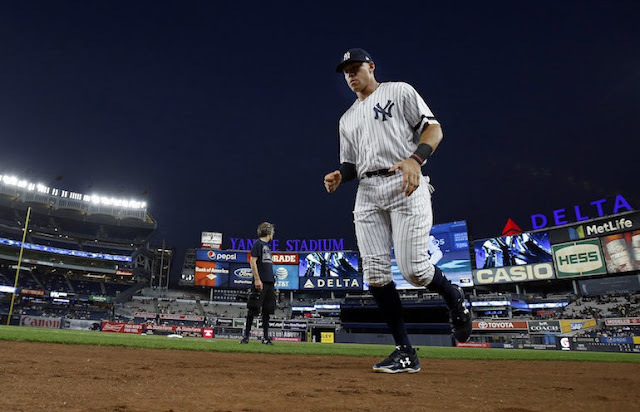 The Yankees had two runners on base in the bottom of the 1st inning, courtesy of walks by Rays starter Blake Snell, but they were unable to score. The top of the 2nd went more smoothly for Montgomery as he set down the Rays in order...three up, three down. No drama...just the way I like it. In the bottom of the inning, Starlin Castro led off with a home run into the left field bleachers to tie the game. Star-light, Star-bright! 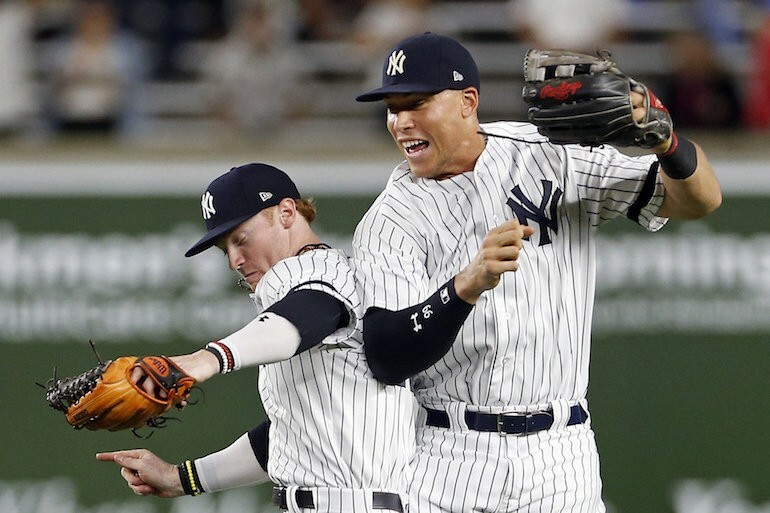 The inning continued as consecutive singles by Todd Frazier, Clint Frazier and Ronald Torreyes loaded the bases. Aaron Hicks picked up the go-ahead RBI when he took a walk to bring the Toddfather home. Next up, Aaron Judge walked on four pitches to bring Red Thunder home. The Yankees were up, 3-1. The Rays pulled Snell, who hadn't lost a game since late July, and replaced him with Chaz Roe. Gary Sanchez lined out to first, with Judge staying put, but the Rays caught Hicks off second (he couldn't get back in time) to complete the double play. With Matt Holliday batting, Judge stole second so the Yankees had runners at second and third. Roe uncorked a wild pitch that got by Wilson Ramos all the way to the backstop, and Torreyes ran home with the fourth run of the inning. Judge moved to third but he was left stranded when Holliday flied out to center. Jordan Montgomery kept the Rays off the board through the 6th inning and turned the game over to the bullpen in the 7th. Tommy Kahnle was up first and he retired the Rays in order, including the last two by strikeout. 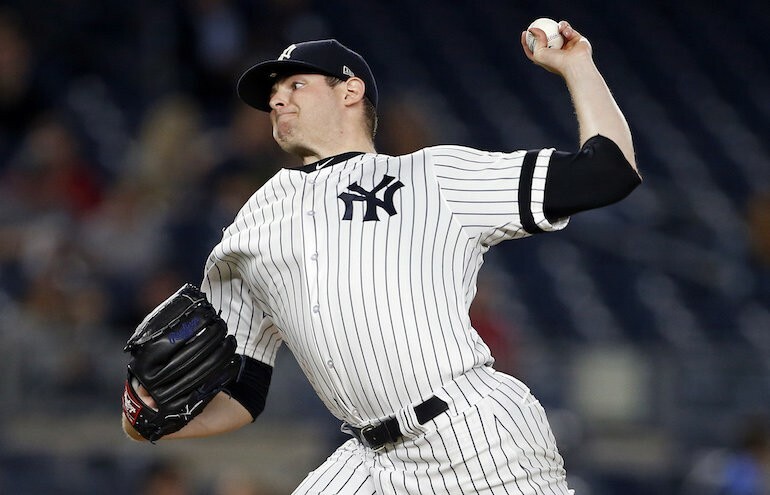 David Robertson took over in the 8th. He walked the first batter, Stephen Souza, Jr, but the runner did not advance past first base as D-Rob retired the next three Rays. In the bottom of the 8th, with Rays reliever Austin Pruitt on the mound, Ronald Torreyes drew a one-out walk. While Brett Gardner was at bat, a wild pitch allowed Toe to move to second. Gardy grounded out to second, advancing Toe to third. Aaron Judge walked to put runners at the corners. After a brief delay that saw Home Plate Umpire Dan Bellino toss a fan for tipping pitches, Gary Sanchez singled on a fly that dropped in front of center fielder Kevin Kiermaier (to my surprise) which brought Toe home to score. Matt Holliday reached on an infield single to short that Adeiny Hechavarria wasn't able to field cleanly (made a running stop on the grounder in shallow left but the ball dropped out of his glove) allowing Sanchez to slide safely into second just ahead of the throw. Judge scored on the play and the Yankees had increased their lead to 6-1. Chase Headley grounded out, back to the pitcher, but the Yankees took the five run lead to the 9th. Dellin Betances, who I thought should have pitched in Monday's win over the Royals, entered the game in the non-save situation. A ground out and two fly outs on seven pitches, Game over. I was very glad to see a clean (and short) outing by Betances. The Yankees win! The Yankees (88-69) picked up another game on the Boston Red Sox with the win. The Sox lost to the Toronto Blue Jays for the second consecutive day. The Blue Jays won the game, 9-4, behind J.A. Happ. The loser for the Sox was Chris Sale, a loss that might tilt the AL Cy Young Award toward Cleveland's Corey Kluber. The Yankees trail the Sox by three games with five to play. The Yankees secured home-field advantage for the Wild Card game with the win although they have not given up on the AL East championship. The Minnesota Twins won yesterday, 8-6 over the Cleveland Indians, and lead the second Wild Card spot by five games over the Los Angeles Angels. It was a great rebound by Jordan Montgomery (9-7). Lately, it has seemed like most of his struggles happen early. The Rays could have changed the complexion of the game with a first inning grand slam but Monty persevered after the incredible catch by Aaron Hicks. In six innings of work, he scattered six hits to hold the Rays to the single first inning run. He walked only one batter (the first inning walk of Evan Longoria), and struck out five. The dude looks to be a strong piece for the rotation in 2018. Hats off, again, to the Bullpen with three hitless innings of relief. 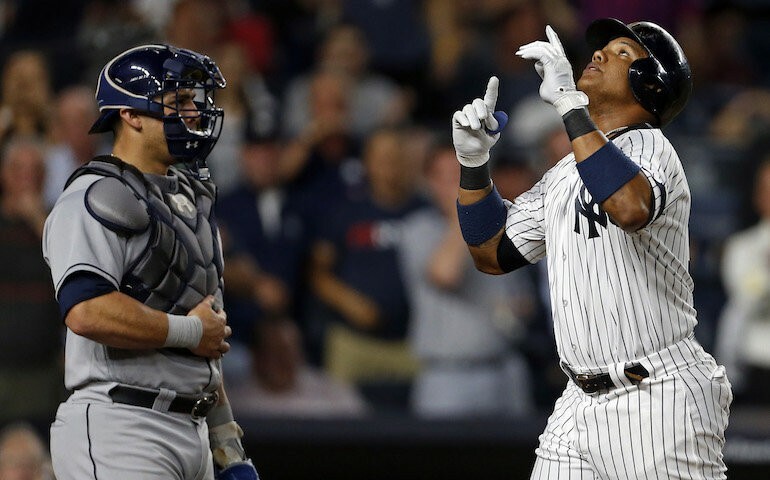 Starlin Castro was 3-for-3, including the second inning home run. It's great to see him hitting again and just in time! No home runs for Aaron Judge after two consecutive multi-homer days, but he was in the mix with a run batted in, his 109th, thanks to the bases loaded walk and a run scored. I attended a few games at Target Field in Minneapolis, MN several years ago so, apparently, I am still on the Minnesota Twins mailing list. I received the notice that the Twins' American League Division Series tickets go on sale on Thursday beginning at 10 a.m. CT. A bit of wishful thinking of their part. Hopefully, the Yankees can ensure those tickets are never used. The Rays have made a pitching change for the series finale on Thursday. Alex Cobb had been the scheduled starter. With their season nearing its end, Rays manager Kevin Cash decided that Cobb had reached his season innings limit (179 innings in 2017 after only 22 in 2016). Jacob Faria (5-4, 3.33 ERA) will get the start versus Sonny Gray. Have a great Wednesday! I'd like a win and maybe a couple of Aaron Judge home runs today, please. Go Yankees!